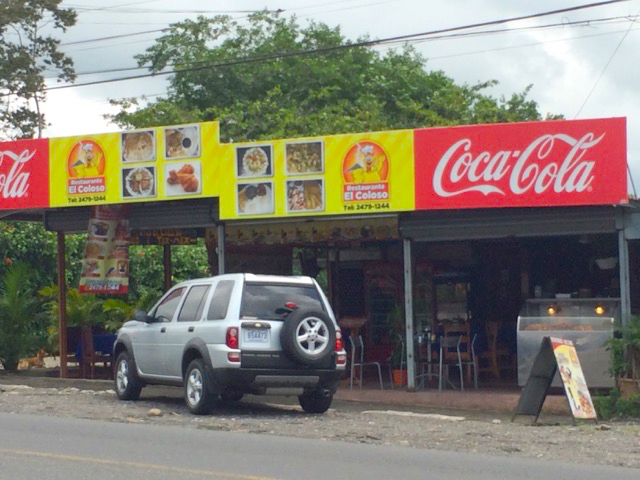 We flew into Costa Rica on a Red Eye, and all we wanted to do is pick up our car and go. “Mom! Feel it!” As the sweat rolled off of all of our foreheads Eli exclaimed, “Mom! Dad! Feel my seat! Seriously, feel the headrest! There is goo all over it!” Eli was correct. Not only was there goo all over his seat and headrest, there was dark colored goo inside the door. Gross! “Sure.” Then Dave asked, and then man immediately summoned another dude to find us a car. As fast as the dude pulled the car out, and threw our luggage into it, we were doing a goo check of the new one. We were hot. We were tired. We were (still) dripping pools of sweat. We had just purchased $35 US of bottled water (yes, that is correct), and with our thirst well accommodated, we realized how hungry we were. We are totally smartphone-dependent, yet had no internet to Google Map or Yelp us somewhere, and that the boys were starving. “Do you want to find something local?” Dave asked me. “What? Are you sure?” He asked. ? Dave knows that I often turn my nose up at McDonalds in hopes of finding a healthier alternative. “Maybe they have free Wi-Fi.” I answered. In seconds we went from the grocery store around the dusty construction-filled roundabout, turned left and were at McDonalds. [insert a Spanish-styled Hallelujah chorus here]. We walked inside. I pulled out my smartphone. 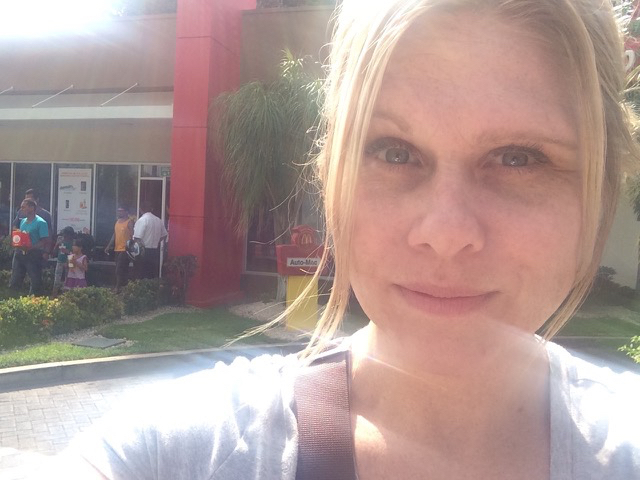 I checked and indeed Liberia McDonalds has free Wi-Fi. [again I heard the Spanish-Styled Hallelujah chorus]. The place was packed. I immediately offered up the McFlurrys. Dave stood in line while we saved seats. Our food arrived. My lovely husband got me my own order of fries. McDonalds in the moment had the best and saltiest, most satisfying french-fries ever; french-fries that are heaven to a stomach after a long international flight. The McFlurrys were a hilarious misstep of deliciousness: not mixed, syrup and cookies on top. Dave thinks they do not have the McFlurry mixing machine working properly. None of us cared, because they were awesome. And then there were the bonus straws. See, when you sip a cold beverage, the straw turns pink. “Dave, hey look.” I said as my Coca-Cola-filled straw went from clear to pink. We were relaxed, well fed and no longer dripping pools of sweat. We Google Mapped our journey and knew where we were headed, and two local security dudes asked us to take their picture. Way to go, Liberia McDonalds! Way to go! I understand why your entire town may have been inside your air-conditioned and free Wi-Fi doors. Honestly, I do not blame them. We were on our way, satisfied and happily refreshed. Because Dave was able to Google Map us at McDonalds, we knew where we were headed. We drove through dusty towns on the Pan-American highway. 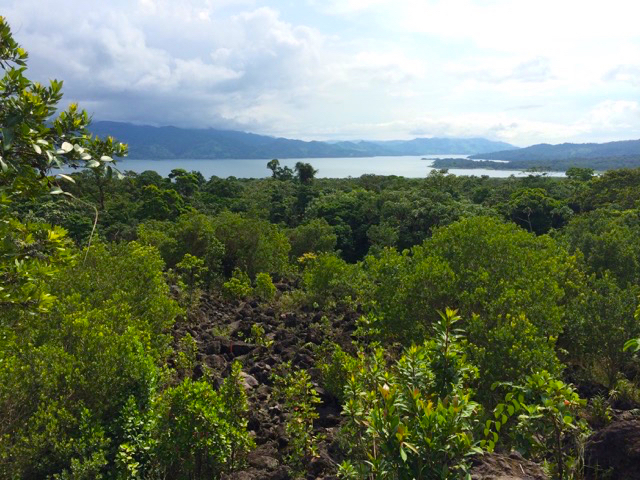 We turned somewhere and then along beautiful and gigantic Lake Arenal. Hours passed by and of course we were hungry again. I always travel with a various assortment of bars and with only salt French-fries in my stomach, I desperately wanted one. My Luna Bars were easy to access. I also know the Luna Bars have a yummy coating. I grabbed my Luna Bar and it was a mushy hot mess trapped in its Luna Bar wrapper. As the cool breeze of the air conditioner touched my face, a flash of insight shot through my brain. “What if I hold my Luna Bar up to the air conditioning vents?” It worked. After minutes of holding and flipping from one side to the other, my bar reanimated itself into the bar it was meant to be. 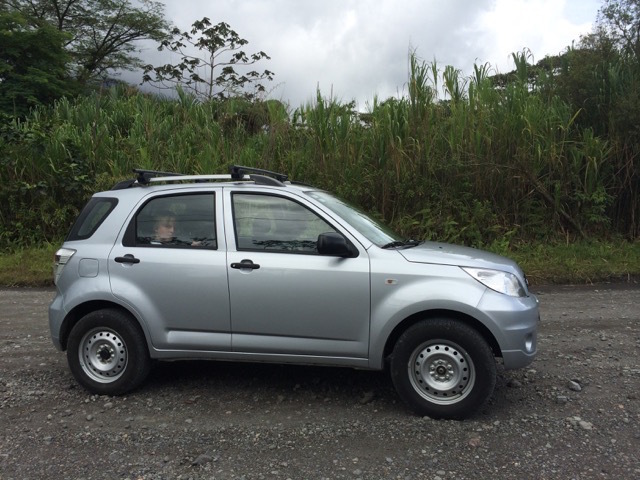 We finally reached or destination, La Fortuna, Costa Rica. 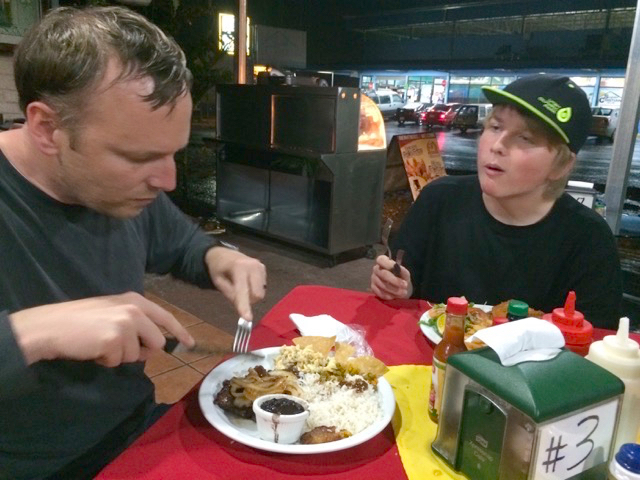 And yes, we were hungry (again – dudes, I have two giant and still growing teenage sons). Our drive from Liberia was a long and pleasant. Now at our lovely little lodge (El Silencio Del Campo), Dave quickly looked up a few restaurants. We left, and once we are on the road, nothing made sense. We could not find any of the Spanish named eateries. We drove and drove. The boys told us, “We are hungry,” and we drove some more. We did not want to pay unnecessarily high tourist trap prices. Then, out of the corner of our eye of our eye we saw all these people sitting in an open-air roadside café (El Coloso). “Hey, they look like locals.” I said. We stopped. We ordered. We devoured. Sure enough, the food was delicious, and not expensive. Dave is certain this place is the place to go and here is why. Dave observed, “See, the steady stream of locals coming in to buy fried chicken and tortilla chips to go.” He is correct. I ordered the pechuga de pollo. It was awesome and seasoned like nothing else.. You can ask for platanos (plantains). Yum! Our dinner was finished and we were back at our lovely little lodge, (El Silencio Del Campo). As I took my sandals off I noticed black marks all over my foot and that something sticking to my (unusually big) big toe. I leaned over and touched my toe. My toenail polish was gummy, smudged and had bled onto my foot. At first I thought it might be the heat and humidity. Then I remembered. Right before dinner I sprayed my ankles and feet with bug spray. Bugs love me and this time I was going to be prepared. Little did I know that Deet melts the feet, or better, that Deet melts nailpolish. Of course it does. So if I can save you any heartache, I will. 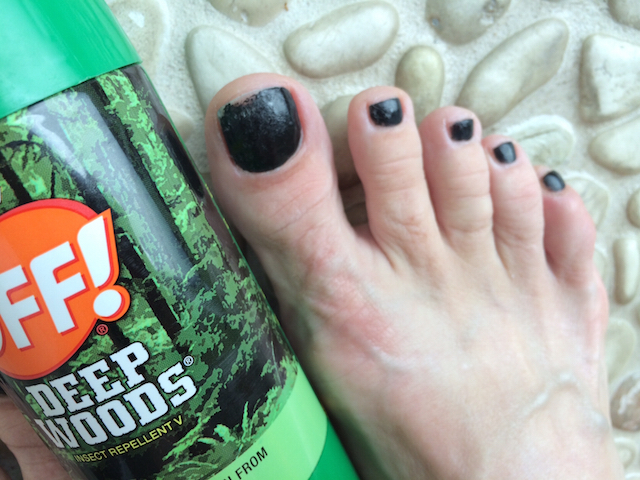 Next time you are in the Jungle, or Minnesota, for that matter, and you are spraying for bugs, watch the pedicure. You are welcome [wink wink]. We had been up for nearly twenty-four hours. Our fatigue melted into satisfaction. We were safe, well fed, and cool. And as I wet wiped the nail polish off of both feet, Dave and the boys were already in bed. I would call our day great, and our simple out-of-the country hacks (travel solutions) a success. 4. When you do not know where to eat, look for the locals.